Families, communities, and the nation itself were irretrievably altered by the Civil War and the subsequent societal transformations of the nineteenth century. The repercussions of the war incited a broad range of unique problems in Appalachia, including political dynamics, racial prejudices, and the regional economy. 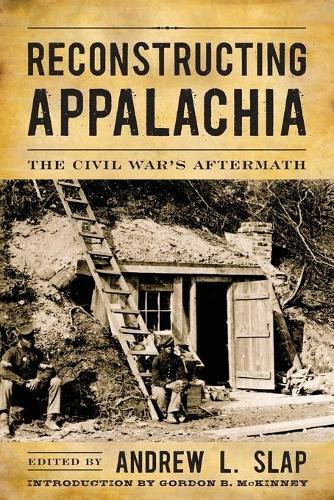 Andrew L. Slap's anthology Reconstructing Appalachia reveals life in Appalachia after the ravages of the Civil War, an unexplored area that has left a void in historical literature. Addressing a gap in the chronicles of our nation, this vital collection explores little-known aspects of history with a particular focus on the Reconstruction and post-Reconstruction periods. Acclaimed scholars John C. Inscoe, Gordon B. McKinney, and Ken Fones-Wolf are joined by up-and-comers like Mary Ella Engel, Anne E. Marshall, and Kyle Osborn in a unique volume of essays investigating postwar Appalachia with clarity and precision. Featuring a broad geographic focus, these compelling essays cover postwar events in Georgia, Kentucky, North Carolina, Tennessee, West Virginia, and Pennsylvania. This approach provides an intimate portrait of Appalachia as a diverse collection of communities where the values of place and family are of crucial importance. Highlighting a wide array of topics including racial reconciliation, tension between former Unionists and Confederates, the evolution of post-Civil War memory, and altered perceptions of race, gender, and economic status, Reconstructing Appalachia is a timely and essential study of a region rich in heritage and tradition.